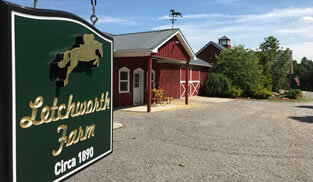 Make yourself at home and enjoy all Letchworth Farm has to offer. Take a leisurely dip in the swimming pond, sit back and take in the stunning views or take advantage of our equestrian facilities. Dining room, lounge area and study/reading area. There is a large porch to the front of the house with rocking chairs. 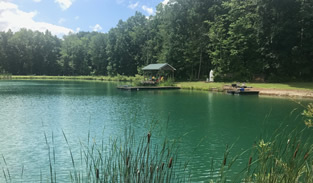 The grounds extend to wooded trails leading to the 1.5 acre swimming pond with BBQ facilities, boardwalk and lake house with large colorful Adirondack Chairs. The garden leads to a dining/relaxation area with a decorative pond, firepit and a large elevated deck with views into the valley. There are 15 stables for guests with horses plus an indoor arena, cross country course and a large outdoor arena. Riding trails through the farm and a short hack into the Park.